I know you’re asking that question because you want to see the same type of success/money/freedom that the high performers you know have. That is the purpose of High Performance Habits by Brendon Burchard. Burchard wants to expose what high performers do so that we can do it as well and increase our performance. There are three fundamental questions that Burchard tries to answer for us. He also recognizes that we measure things, and measure more, but remain troubled. We remain in a state of clutter where we don’t get good work done. He wants to break through that. We’ve been sold this alluring vision of a world where new gadgets will make us smarter, faster, and better. But many of us are beginning to see behind the hype. Tools cannot replace wisdom. You can have all the gadgets in the world and dive deep into the “quantified self” movement, where every step, second of sleep, beat of your heart, and moment of your day is tracked, scored, gamified. But a lot of people are connected and tracked and remain troubled. This harkens back to the idea of any benefit thinking proposed by Cal Newport in Deep Work. Any Benefit thinking is the idea that if there is any benefit to a tool we use it regardless of the costs. You can find an audio version of this here. Make sure you don’t miss an episode of Should I Read it by subscribing. Burchard echos it as he acknowledges that we’ve been sold this vision of the future and more and more things to measure because there is some benefit to measurement. We do not see much, but we keep clinging to the idea that there is some benefit. Before we can dive into the 6 Things that Burchard found to help explain why high performers are doing so well, we should get a handle on his definition of what high performance is. High Performance Definition: succeeding beyond standard norms, consistently over the long term. This is not a flash in the pan. High Performance is sustained. Performance that came again after some failure. Performance that is relentless in the face of setbacks. Note the part about failure I mentioned. High performers aren’t always successful. They do keep going though. They do embrace the hard times and endeavour to learn from them. Too many people avoid any sense of hardship in their lives. They fear they can’t handle it or that they’ll be judged or rejected. But high performers are different. It’s not that they lack and self-doubt at all. It’s that they look forward to trying new things and they believe in their abilities to figure things out. This reminds me much of Mark Manson1 and his contention that we’ve made any type of hardship into a pariah of experience. With the understanding of what high performance is, and how it doesn’t always mean success in every field, we can look at the High Performance 6 (HP6) which takes up the bulk of the rest of the book. These are the 6 Habits that Burchard saw repeated as he examined the research on high performers. He also saw these items work for his coaching clients. He refers to them later in the book as the HP6. He claims that if you lack these things, even if you’re hugely gifted and highly motivated, you’ll see little long-term success. Without the HP6, even the most gifted person would be lost, tired, unmotivated, unproductive, alone, or fearful. I can see this, especially with the seeking clarity habit. Without clarity, you’ll run all over doing many things and making little progress in one field. It doesn’t matter how good you are if you never push on something long and hard enough to see it through to completion. Before we dive into the HP6, Burchard addresses being ready to become a high performer. If you’re not ready to invest in the habits and make some sacrifices then you’re not ready for the HP6. One other division that Burchard makes is that the first three habits are personal habits and the final three are social habits. That means the first three are more “inside” you and the final three are more “outside” you in that they have others more heavily involved. The last two habits especially require others to interact with. In a recent survey, I did of my readers; the most requested content topic was building a niche. Finding your niche and Burchard’s first habit of clarity are very similar. Both of them require testing different areas to see if they fit you. You generate clarity by asking questions, researching, trying new things, sorting through life’s opportunities, and sniffing out what’s right for you. It’s not as though you walk outside one day and the Piano of Purpose falls on your head and all things become clear. Clarity is the child of careful thought and mindful experimentation. There I no quick fix niche advice I can give you. Even the book I wrote to help you find a niche and market to it requires that you spend time in experimentation. You must look at what you’ve done, what you enjoy, what people will pay for, and a myriad of other factors. Out of all of these factors you have to start to experiment with the niche you have. I regularly modify this question based on the circumstances. Sick kid I need to take care of, then the question becomes: “What is the ONE thing I can do in the next hour (while she naps) that will make the rest of my work easier or irrelevant?”. Then I only do that thing ignoring all other work no matter what state it’s in or what expectations are around it. The other big part of clarity is knowing where you want to be. Who you want to be. You need to know this so that you can filter the decisions that come your way against where you want to go. In BootCamp we spend the first number of videos working on this single question so that you can build your filter documents. In almost every basic question of who they were or what they wanted, the highest performers had a great ability to focus on the future and divine how they would achieve excellence. They didn’t just know who they were; indeed, they rarely focused on their present personality or preferences. Instead, they consistently thought about who they wanted to be and how to become that. High Performers know who they want to be in each of there areas and they make decisions now that will lead them towards these areas. Decisions about how to spend their time, what projects to take on, what books to read, and what volunteer opportunities to take on. Clarity is all about knowing where you want to go, and being willing to say no to some of the short-term opportunities that come your way when they don’t fit into your plans. High performers have the magical trifecta of capital “E” energy — that holistic kind that includes positive and enduring mental, physical, and emotional vibrancy. It’s the key force that helps them perform better in many areas of their life. You read that above and you want to be it. A person that comes into a room and has energy. I’m not talking about some perky bouncy person. That’s some superficial measurement of energy and not what we’re talking about here. I’m talking about someone that has the capacity to be present with you because they’re not emotionally exhausted. Someone that’s relatively healthy and has the energy to do the things they want. That has the ability to focus on the task at hand because they don’t let distractions infect their life. To get to this Burchard gives us three practices. Releasing tension and setting intention is all about breaking the tension between contexts. Have a stressful day at work, don’t bring that home and take it out on your kids. Burchard recommends something along the lines of, take 5 minutes when you park the car at home. Think about the tension that you have from the day and let it go. Then, talk yourself through the type of parent/husband/father/mother/wife you want to be in your house. Set the intention to be that. I’ve used this idea even as a break between getting angry with one of my children and then setting the intention about the type of parent I want to be. Taking even 60 seconds while my child is yelling to reset myself has been hugely helpful. Evidently “Bring the Joy” is one of Burchard’s things. He sells bracelets that have the saying on it. I didn’t know this, but I get the sentiment. Positive emotion is a prerequisite for high performance. And only you are in charge of your enduring emotional experience. Remember the lesson from the last chapter: You can choose your feelings (the interpretations you have about the emotions that you sense), and the more you do that the more you rewire how you experience emotions. You’re in charge of how you feel. Blaming others for how you feel is easy. It absolves you of responsibility. It blames them. It also takes away any control or power you have in the situation. If they make you feel angry, you have no control. I revised the sentences above about my kids with that in mind. They don’t make me angry, I respond in anger. If you struggle with joy, take that little computer out of your pocket and set a reminder a few times a day. When it goes off, take a second to look around and be joyful for something. We started a “thankful” practice at dinners in my house and that single thing every night hugely changed how our family interacted all day. We’ve even started “telling on” each other, which means we tell on other family members when they do something awesome. To dive even more into how happiness is good for us, look at The Happiness Advantage. Too often, achievers blame their low physical energy on “how I’m built” or on the time demands of their industry, company culture, or personal obligations. This is giving up your control again. High performers are way more likely to work out. They’re way more likely to sleep 7-8 hours a night. They aren’t out there “hustling” 22 hours a day. When they’re working, they focus hard on the task at hand get their work done. One stunning study from our research on over twenty thousand high performers is that the top 5 percent of all high performers are 40 percent more likely to exercise at least three days per week than the 95 percent below them. If you’re out of shape, don’t blame work. Take control of the problem. You don’t have to do anything. You don’t have to show up for life, for work, for your family. You don’t have to climb out of bed on a tough day. You don’t have to care about being the best you can be. You don’t have to strive to live an extraordinary life. And yet, some people do feel they have to. Why? The why is answered by necessity. The fact that for some, high performance is something that must happen. There is no choice about it. This necessity could come from your kids, your spouse, or supporting your extended family. These obligations are not negative to high performers. They view them as a privilege. It’s one of the things that causes a gap in underperformers. It’s hard for underperformers to see that the obligations are not always a negative thing, which is why we found that underperformers complain more about their responsibilities at work than their high performing peers. Underperformers lament the requirements and this takes away their control again. They look at work and do it as a “must” but with a chip on their shoulder. Again, there are three practices from Burchard to raise your necessity. Then, do the tasks that bring your A game. I’ve found this most impactful in conjunction with the releasing tension and setting intention exercise from earlier in the book. Asking the question as part of setting intention lets me know who I need to be there for. High performers don’t keep their goals, or the why behind those goals, secret or silent. They confidently affirm their goals to themselves and others. If there is one necessity practice that seems to divide high performers and underperformers the most, it’s this one. Underperformers are often unclear about their why, and they don’t use affirmations or speak about the whys they do have. This doesn’t mean you broadcast your goals for the whole world to know about. It does mean that you tell those that you care about, and care about you. This means that you know WHY, you work. If you’re struggling with that, Jeff Goins wrote a great book to help you find why you work. If you truly want to increase your performance in any area of your life, get around some new people who expect and value high performance. Who is around you? Are they also striving? Are they high performers? Peter Drucker has said that we’re the product of the five people we hang out with most. What are your five top friends producing? If you’re not happy with that answer, it’s time to level up who you have contact with. That’s more than just reaching out to awesome people though. Awesome people are busy. They have a bunch of requests for their time. You need to take some steps on your own first so that you’re bringing some value to the conversation. You want to get around more successful people? Then earn your way into that party by becoming exceptional at what you do. Work hard. You can level up who you “hang out” with through books as well. Reading the books of those authors you look up to, is one of the cheapest ways to get their consulting. Reading their blogs is even cheaper. Instead of putting more TV in your head, what about a book or an excellent documentary. But more likely a book. That concludes the first three habits, the personal high-performance habits, and brings us to the final three. The social high-performance habits. Oh, the world of productivity writing. It’s huge with everyone trying to make their mark on it. Including me in some ways. To get more productive starts with goals and focus. The fundamentals of becoming more productive are setting goals and maintaining energy and focus. No goals, no focus, no energy — and you’re dead in the water. But Burchard doesn’t stop there. He wants to blow up the notion of “work-life balance” as a thought about hours. Instead, he wants us to focus on happiness and harmony. Do we feel happy about the hours we spend working versus the hours doing other things? Do we have harmony in our life? This also brings into question the meaningfulness of our work. I have a friend that quit his job when the main product became popups. He couldn’t abide supporting one of the things that he feels is the bane of the internet. He was performing poorly and realized that while he loved the technology part, he hated the result of his work. His work had negative meaning. To get more productive Burchard gives us three practices we can use. High performers have mastered the art of prolific qualtiy output (PQO). They produce more high-quality output than their peers over the long term, and that is how they become more effective, better known, more remembered. They aim their attention and consistent efforts toward PQO and minimize any distractions (including opportunities) that would steal them away from their craft. It feels easy to say, do the work that matters, but it’s hard to know what it is that matters. I don’t have an answer for you, except maybe look at those that are successful in your field and see what they prioritize. Maybe you don’t have the finances to sit and write for three hours every morning because you have another job and need to…pay some damn bills. But what if you wrote for an hour every morning instead of just when it fits. What if you contributed to the open source project with testing issues to see if they are real or fixed? Simply cleaning up the issue queue is something of note that will get you noticed by many, even if it’s not glamorous. Whenever I tell people to create more output, inevitably I run into the perfectionists. They say things like “Well, Brendon, I can’t just put more stuff out there. I’m a perfectionist. I have to know that it’s absolutely right and will be loved.” Perfectionism, though, is just a delay logic fancied up to look respectable. The reason poeple don’t finish more things isn’t perfectionism; it’s that they rarely even begin or they get tangled up in doubt or distraction. Remember, you won’t ever be “ready” just start. Don’t worry about perfection. Start shipping. Instead of hustle, what if you had the five moves you needed to make happen to achieve your goal? Not sure what the five moves are? I bet you’re lying about the first two. If there were only five major moves to make that goal happen, what would they be? If you want to be a core contributor to WordPress, then move one is to start contributing in some fashion. If you want to be a writer, then your first move is to start to write. Want to draw, draw. Go as far as you can see and then start researching the next moves and go further. Block out and protect the time you need for these moves. This ties in very tightly with your five moves. You need to be good at the core skills that are required for your field. You need to become a master, which means putting in the time and practice to become one. I was talking to a friend recently that lives on the other side of Canada. He was sick and his family needed help. Kids needed to get places and groceries needed to be purchased. He was amazed at how many people showed up to help when his family asked. At times they had to ask people to stop bringing food by because they didn’t have space in their fridge or freezer. Ask for help, people will show up. In this is also the idea of perfectionism. That we need to portray our “perfect” life which doesn’t require help. You’re not as important as you think. This is fine. It frees you to do awesome stuff without worrying what others think. They have way too much of their own stuff to deal with to worry that much about you. There are three practices that Burchard has seen work as you try to gain influence. First, teach people how to think about themselves. Help them build a Growth Mindset and develop Grit in the midst of their struggles. Second, push people to become better versions of themselves. High performers challenge the people around them to rise to higher levels of performance themselves. If you could follow them around as they consistently challenge others to raise the bar. They push people to get better, and don’t apologize for it. Call people to stronger character. Help them have more empathy in their relationships. Teach people to invest deeper and understand before they try to convince people that their right. Finally, contribution. Help people bring more value to their relationships. Not just business, but helping them show up with their A game for their family. The final practice is being a model. If you want teamwork, then be someone that works with the team. If you want your kids to read, they better see you reading. This is not manipulating because that’s going to kill you in the long term. Is it possible to get ahead in life by manipulating others? You betcha — for the short term. But ultimately, manipulators burn all bridges and find themselves disconnected, unsupported, alone. They find no long-term success with relationships or their own well-being. We smell frauds, or at least we smell something funky and eventually figure out where the smell is coming from and run away from it. What type of role model are you today? Courage is not having no fear; it’s acting in the face of fear. You can only have courage if you’re facing things that frighten you. We’re less courageous as a society today because we avoid struggle, and that decision leaves us with underdeveloped character and strength — two key ingredients for courage. This echo’s Mark Manson again. I won’t repeat the quote because it’s at the beginning of this post, but we only show off the awesome stuff. Even the “being real” posts we see on social media often come across as surface. As a veiled attempt to be alternative and show some barely existent struggles to a following. But we need to honour the struggle. We need to embrace the hard times and realize that as we go through them, others are as well. This is where asking for help can reap rewards. Others can step up, share your fears and help you through them. If you believe in your dream, stay on your path. You need no permission beyond that tingling hope in your sole. These quotes always feel…hollow to me. It’s easy to say “follow your truth” for the successful coach/speaker/author. They aren’t faced day in day out with bills to pay that are not currently paid by your tingling hope. Going through these three questions feels honest to me in a way that “find your truth and live it” never does. Read my full look at The Dip to get a better handle on the three questions. Practice three goes back to raising necessity. Who are you fighting for? What compels you to work? Looking at these people around you, get courageous and take risks to win for them. With the habits out of the way, Burchard gives us a short section of the book dealing with the three traps that can come as you start to become a high performer. If “it’s lonely at the top” then find someone that’s ahead of you and get the help you need. Everyone can win at life. So let’s be honest: You were once a mess, too, or did you forget already? But you improved. Give others the same opportunity. Find someone that’s a mess like you and mentor them to be a high performer. You only need to be one step ahead of them to be able to bring value to their life. Those who are never satisfied are never at peace. They can’t tune into their zone — the noise of a dissatisfied mind prevents them from finding a rhythm that makes them feel alive and effective. Don’t settle for less, but be happy with where things are at now. It’s okay to enjoy where you’re at and the journey. If you’re not happy now, getting a few more zero’s in your bank account will do nothing to change your happiness. More money mostly just magnifies who you are. Don’t fool yourself into thinking that you’ll suddenly be a better person. It’s not going to happen. You’ll be the same person you are now, with more money. This is one of the spots that I hate. Working hard to get “success” and finding you’re divorced and your kids hate you. The whole time you thought you were working towards something awesome for them too. You weren’t. Your wife wants dates. Your kids want to build lego and forts with you. Burchard proposes two ways that neglect happens. Don’t go too fast in too many directions. 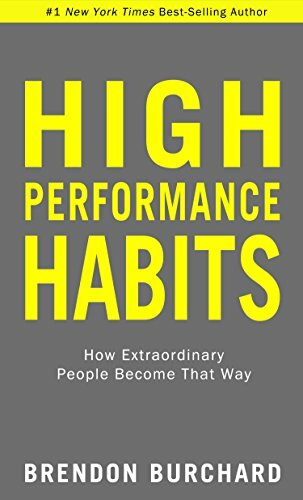 While some specific parts of High Performance Habits may be covered in more detail in other books, Burchard, offers you a great starting place if you’re looking to dive into being a high performer. Not only is there research, but he gives you some actions you can take to start your journey towards high performance. Yes, High Performance Habits from Brendon Burchard is worth reading. But, if you take his HP6 survey from the beginning of the book, get ready for a million emails. It was useful to look at, but man the emails are a killer. Do the survey and then unsubscribe. Brendon Burchard has done lots of research on what it takes to be a high performer. Here he attempts to bring it to you. One fault is that he assumes we can all just "produce more" without worrying about bills and such.